Service Guarantee: We take care of our customers regardless of where they live but Tucker’s Collision Center in Las Vegas would like to take this opportunity to extend our genuine service guarantee to all Enterprise residents. At Tucker’s Collision Center, all services are completed quickly and without stress. If you have a vehicle in need of repair and live in Enterprise, it is now time to consider who is the best collision service provider when you have auto body and paintwork that needs to be done. We are confident in our collision repair services because we are the region’s best GM certified collision repair center. Vehicle owners in Enterprise, Nevada don’t realize how close they are to the area’s best collision service center. Tucker’s Collision Center is conveniently located north of Enterprise within a 15-minute drive. We would like to take this opportunity to let Enterprise residents know that they can bring their car, truck, van, crossover, or SUV to Tucker’s Collision Center in Las Vegas for any level of body/paint work. Gain peace of mind with collision repair service by relying on a GM certified collision center with years of experience restoring vehicles like yours to like-new condition. Tucker’s Collision Center in Las Vegas is conveniently located just off I-15 and Decatur Blvd. 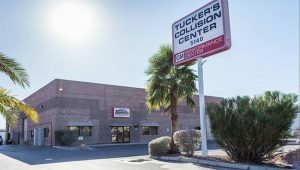 In fact, Tucker’s Collision Center in Las Vegas is a 15-minute drive up Rainbow Blvd for Enterprise, NV residents. Now you don’t have to take your damaged vehicle to Average Joe’s collision repair center to get shoddy service. Instead, you have the option to get the highest quality collision repair service at a GM certified collision repair center. Don’t risk having your vehicle repaired at a questionable body shop when an industry leader is ready to provide high-quality body and paint expertise. If you just realized that you should have been coming to Tucker’s Collision Center in Las Vegas this whole time, we welcome you to schedule an appointment at your convenience. Schedule an appointment today with Tucker’s Collision Center in Las Vegas to have your vehicle repaired at a world-class facility with GM certified body and paint experts.